This survey was carried out by The Wildlife Trust for Bedfordshire, Cambridgeshire, Northamptonshire and Peterborough as part of the Great Gidding Newt Trail Project. Water is vital for survival. Some animals are able to get sufficient water from puddles or dew but amphibians rely on ponds to breed successfully. In the last fifty years, one third of ponds in the UK are thought to have been lost. The reasons behind this loss are varied and include infilling, development, and natural succession. Unfortunately, of the remaining ponds, not all are suitable for amphibians. Although this group of animals breed in water, they actually spend most of their time on land and therefore also have terrestrial habitat requirements. Ponds can become unsuitable for amphibians if they are polluted, isolated from other habitats (e.g. surrounded by intensive arable farming) or poorly managed. Amphibians are capable of migrating between habitats up to 1 km apart so a landscape with interlinked suitable terrestrial and aquatic habitats is critical for the survival of amphibian populations. Great crested newts demand better quality habitats than our other native amphibian species and have therefore experienced a greater decline in numbers and range as a result of the loss of suitable habitats. The range of this species extends across Europe but England is a relative stronghold where legal protection has helped to slow the decline of great crested newts and enhance habitats to suit their needs. The Great Gidding Newt Trail Project is an example of where local action is safeguarding amphibian populations and their habitats. The hedgerows, pastures and ponds in the village create a diverse and well connected landscape that benefits amphibian species. One of the aims of the Newt Trail Project was to survey ponds across the village and gather up to date records on the distribution of amphibians. A total of 21 ponds were identified to be surveyed. The following map displays all of these ponds and those marked with a red dot were not fully surveyed due to poor access or permission not being granted. It is still useful to consider these ponds in the village landscape as it is very likely they are being used by amphibians and other wildlife. Some of the ponds were very overgrown around the edges but it could be seen that the water was relatively clear and not polluted. There was evidence that some ponds donít hold water throughout the year. If a pond dries out in early summer, then this would prevent the full development and survival of the newt larvae and therefore it would not be classed as a suitable breeding site for newts. Such ponds should be protected as stepping stones for amphibians moving between more suitable ponds. Surveys were carried out during the day and evening from 21 March ñ 20th May. Amphibians are more active after dark so the evening surveys were carried out using powerful torches to detect adult amphibians in the water. Observations were also made of bats. During the daytime visits, records were made of the pondís surrounding habitats, plants and invertebrates. Pond nets were used to survey for aquatic invertebrates to indicate the water quality of the pond. Newts lay individual eggs on submerged leaves and fold the leaf over to protect it. Searches of aquatic vegetation were done to confirm whether newts were breeding in the ponds. A sample of eggs was checked to determine their species. 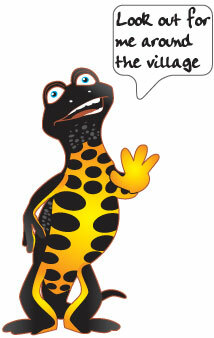 Great crested newts and their habitats are protected by European Law and through the Wildlife and Countryside Act 1981. This means it is illegal to deliberately capture, kill or disturb great crested newts and damage or destroy their habitat. This protection covers the newts as eggs, larvae, juveniles and adults. All surveys for this project were undertaken under licence from Natural England and in accordance with survey protocol for great crested newts and other amphibians. Full survey records were submitted to the Cambridgeshire and Peterborough Environmental Records Centre and shared with Great Gidding Parish Council. This report provides a summary of the findings and some management suggestions for the ponds surveyed. Four amphibian species were observed in the village ponds ñ common frog, common toad, smooth newt and great crested newt. Frogs and toads breed early on in the year (February/March). They often arrive en masse at a pond and the males can be heard calling to attract females. Adult frogs and toads leave the pond soon after breeding and seek refuge on land. Frogs lay large clumps of spawn that contain approximately 400 eggs. Toads lay their eggs in strings that they wrap around submerged plants to ensure they stay anchored. The jelly surrounding these eggs acts as a protection from them drying out but also makes them attractive to predators. Spawn is eaten by ducks, fish, water beetles and many other aquatic invertebrates. Although it may seem that a pond contains too much spawn, the reality is that only a small number of those eggs will make it to adulthood. Newts also experience high levels of predation so have developed another method of protection. Newts breed slightly later in the year (March-May) and the males attract a mate by performing a courtship dance. This involves them wafting hormones towards the female with their powerful tail and showing off their dramatic crest. Female newts lay approximately 200 individual eggs, each one wrapped in a submerged leaf to protect it. The jelly around the egg helps to hold the leaf in place. These folded leaves are a confirmation that newts are breeding in a pond and careful examination can reveal which species it is. Adult newts may stay in the pond for months after breeding but they are less obvious when they are not courting so it is best to survey early in the year. In the summer months, froglets, toadlets and newt efts emerge from ponds to start a terrestrial phase of their life. For the next couple of years, these animals will spend their time eating and sheltering on land until they are sexually mature and will return to a pond to breed. Terrestrial habitat is extremely important for these individuals and the adult amphibians once the breeding period is over. Amphibians require somewhere cool, dark and damp to shelter and a good supply of invertebrates to eat. Hedgerows, log piles, rabbit holes and woodlands are all suitable natural habitats. In gardens, amphibians utilise compost heaps, shelter in long grass and hide under paving slabs and in flowerbeds. Amphibians may travel a short distance to find a suitable area so they often turn up in gardens without a pond. This pond is located at the south-eastern end of Great Gidding off the B660 in a field grazed by cattle. The pond is surrounded by a small area of woodland on one side which borders the road and a hawthorn hedge on the other. There is evidence of the hedge having been laid to increase thickness, presumably to prevent cattle from entering the pond area. The pond is shaded by trees and hedges with the perimeter overgrown with bramble and other scrub making assess very difficult. The mature ash trees overhanging the pond have deposited large amounts of leaf debris along with fallen branches into the water. This has caused a heavily silted pond with a strong sulphurous smell when disturbed. The pond is in a large horseshoe shape encompassing the wooded area, reminiscent of an old moat or ditch. Much of the recession is dry with evidence of greatly fluctuating water levels throughout the year. The main wet area of the pond is along the hawthorn hedge on the south-eastern side. No flora was recorded in the pond apart from encroaching bramble. The poor water clarity and limited access prevented a full survey of the aquatic plants. Water hoglouse and phantom midge larvae were the only invertebrates recorded during the survey period. Encouragingly two male great crested newts were recorded in the pond during a torchlight survey. The area does provide amphibians with very good foraging opportunities in the surrounding fields and woodland. This pond has clearly not been managed for a considerable amount of time. The pond could be enhanced by removing some of the thick bramble scrub which is encroaching on the pond and reducing the height of the surrounding hedge and woodland. This would increase the amount of light reaching the pond and encourage more aquatic and riparian plant species to establish. This increase in aquatic vegetation would in turn increase the oxygen levels in the water and would prove beneficial to the overall health of the pond. Any logs and cuttings from this clearance could be made into dead wood piles placed within the scrub area near the pond to provide increased foraging potential for amphibians and places for them to hibernate. The pond is on the site of the old brick pit, located to the south of Great Gidding village and the playing fields. It is one of the larger ponds in Great Gidding. The pond is easily accessible through the horse grazed pasture on the southern side of the pond, but dense scrub and steep banks around the adjacent sides makes access from other points difficult. The pond is fenced off from the grazed area making it inaccessible to horses. The surrounding hawthorn woodland is generally open with a good amount of dead wood and leaf litter with piles of old bricks and rubble scattered through out the site. This provides a good habitat for amphibians to forage and hibernate. The pond itself has gentle sloping grassy banks on the southern edge. The pond has shallow edges that slope down to the middle area where it is believed to be of considerable depth. The water levels evidently fluctuate seasonally but it is not known for the pond to dry out. The pond area has a good proportion of open water allowing for most of it to be surveyed by torchlight. There is a stand of common reedmace in the deeper area of water which provides good cover for nesting wildfowl such as coots and moorhens. The pond is rich in invertebrates, evident by numerous bats feeding over the pond during night-time visits. Greater diving beetles and greater water boatmen were observed in good numbers along with Damselfly larvae and caddis fly larvae. These aquatic creatures prefer water of good quality with high oxygen levels so indicate a healthy pond. There is a well established amphibian population present in the pond with four species being recorded (common toad and frog, great crested and smooth newts). The large number of toads recorded (maximum of eight males on one visit) suggests this pond is used for breeding. Toads breed earlier in the year so it is unlikely to find them in very high numbers in April-May. The pond is deemed to presently be in favourable condition for amphibians. The narrow shaded area at the eastern end of the pond would benefit from some clearance of encroaching trees. This would increase light levels and encourage a greater diversity of aquatic plants to grown increasing the overall quality of the pond. There appeared to be very few plants suitable for egg-laying newts however, if need be, they will use dead leaves instead. The surrounding hawthorn scrub provides very good foraging and sheltering opportunities for amphibians. There is little ground flora though so opening up the canopy would help to increase the amount of light and the growing opportunities for plants. The area appears to support a number of rabbits who are keeping the grass very short. Ponds 3A & 3B. Mill Farm, Chapel End. These two ponds are located on Mill Farm in the Chapel End area of the village. Pond 3A is located at the back of the farm below the hard standing yard and barns. This pond is designed to store rainwater from the yard and intercept any effluent run-off before it reaches the natural water system. The drainage pipe from the yard feeds directly in to the pond. The pond is small, round and deep, (over 1 metre deep in the centre). It has steep sides all around and the water levels donít seem to fluctuate much. The pond is open with no significant shadowing from surrounding vegetation. Pond 3B is located in a field around 25 metres to the west of pond 3A. This pond is almost completely shaded by the surrounding bramble and hawthorn which also makes access very difficult. The pond has very steep banks and seems to be fed by the ground water level, with pond depth fluctuating seasonally. Pond 3A has a surprisingly large amount of water mint and some submerged vegetation present. A few soft rush plants have established on the banks. There is an abundance of water fleas, mayfly and damselfly larvae and both lesser and greater water boatmen indicating good water quality. Small fish are present in this pond which will predate on newt tadpoles and other small aquatic invertebrates. Both smooth and great crested newts were observed which is fantastic considering the working nature of the pond. Some newt eggs were seen on water mint but they were out of reach so could not be checked for a species. Pond 3B has poorer quality water which was indicated by the low diversity of aquatic invertebrates. Only water fleas and phantom midge larvae were found and these are tolerant of water with low oxygen levels. The water was cloudy at the time of the survey and there was no evidence of submerged vegetation. Pond 3A is primarily a working farm pond but it clearly has benefits for wildlife too. The main risk to the quality of the pond is the nutrient input from the run-off. The nutrient levels of the pond can be reduced by removing algae as it appears and leaving this to compost elsewhere. This must be done carefully as aquatic invertebrates are bound to be in amongst the algae and in the summer it may contain newt tadpoles. Removed algae should initially be left on the edge of the pond to allow any creatures to crawl back in to the pond. Pond 3B would benefit from clearance of some scrub from around the edge to increase light penetration and boost the oxygen levels of the water. Any wood from this clearance should be used to create log piles for the newts to shelter in. These ponds are both located within the field at the rear of Woodway Farm. Pond four is adjacent to the footpath and is bordered by bramble scrub on one half. The open half extends in to the long grass according to current water levels. The surrounding field is believed to be grazed and boasts some mature ash trees. The nearby hedge is dense with thick bramble growth near the base. It supports some mature trees and is approximately three metres wide. The water is relatively shallow and very clear and the base of the pond has deep silt. Pond five is now dry and appears to have not held water for some years. It was not possible to survey this as a pond. The hedge and surrounding bramble scrub provides excellent sheltering and foraging opportunities for amphibians and complements the rough grassland habitat. The hedge acts as a corridor for migrating amphibians and helps connect the ponds in the Chapel End area to those off the Main Street. The pond itself does not support aquatic plants but if newts were to breed there, they could lay eggs on the submerged grass. This however is a risky strategy as the pond is prone to reducing in size in the drier months and this could leave the eggs exposed to drying out. No amphibians were observed here during the survey. It is likely that the pond is used by animals moving between different habitats and is therefore a valuable component of the local pond network. Only phantom midge larvae were found which indicates the pond may not be able to support a population of amphibians due to a limited food resource. Little intervention is suggested for this pond as it fulfils its role as a stepping stone pond well. The bramble and scrub should be prevented from engulfing the pond as it is the lack of leaf litter and the amount of light reaching the water that allows its clarity. To prevent the pond from completely drying out in the summer and freezing in the winter, a deeper part could be dug at the far end. Chapel End pond is owned and managed by Great Gidding Parish Council. The pond is fed by run-off from the road and rainwater. Today it is managed to complement the surrounding environment and as somewhere for people to observe wildlife. There is a bench overlooking the pond and a wooden fence surrounding it for safety. The pond is located in the corner of a grazed field and, although fenced, is sometimes accessed by livestock for drinking. In the winter of 2009, the pond was subject to restoration work to remove vegetation that had choked the pond and to remove a deep layer of silt. In June 2010, smooth newt larvae were observed and the pond was already responding well to the work. The pond is set below the adjacent field level and there is a fragmented hawthorn hedge on top of the bank. The southern edge of the pond has a gentle bank of rough grassland and wildflowers which is kept quite short. Plants found here include creeping and celery-leaved buttercups, common vetch and lesser trefoil. Both smooth and great crested newts were observed during the surveys and larvae of both species were also found. The pond has very good water quality and supports a diverse invertebrate community. Pond dipping surveys revealed a number of water beetle species, greater pond snails, water fleas, greater water boatmen, and larvae of damsel-, stone-, and mayflies. During one visit a broad-bodied chaser dragonfly was seen laying eggs in the water. There is a good variety of aquatic plants including submerged and emergent species. There is an abundance of fan-leaved water crowfoot along with water mint, brooklime and water parsnip. This pond has already undergone significant restoration work and will now only require limited intervention. On occasion the pond experiences algal blooms as a result of the livestock accessing the water. Animals introduce nutrients through their faeces which causes an imbalance and an increase in algal growth. Measures have been taken to restrict access between the field and the pond and this will help the problem. Algal blooms may still occur and the algae should be removed to help reduce the nutrient levels. This must be done carefully to avoid removing aquatic creatures with the weed. Any weed that is removed must be left on the pond edge to allow creatures to crawl back to the pond. Particular care must be taken in the summer when newt tadpoles are in the pond as they will not be able to breathe out of the water yet. The mature ash trees adjacent to the pond do not currently cast too much shade but this must be monitored and their pollarding considered in future years. This would ensure the trees remain but not at the detriment to the pond. The perimeter hedge has many gaps and does not provide much cover for amphibians at ground level. New hawthorns could be planted in the gaps and in time the hedge laid to thicken it up near the base. This would enable amphibians to use it for hibernation and migration. This pond lies on a ditch line that runs from Mill Road in the north to the chapel in the south. The pond has been lined and is managed to ensure water levels are reasonably stable with a slow in and outflow of water. The southern end of the pond has very steep sides and the liner extends approximately 1 metre above the water level. The northern end is very overgrown with dense bramble and was inaccessible at the time of the survey. The surrounding area supports a young planted woodland, hedgerow and grazed pasture which connects the pond to other amphibian-friendly habitats. The grass immediately around the pond is mown short. The pond is fenced to prevent livestock from accessing it. This pond hosts three species of amphibian – common toad and smooth and great crested newts. The water is very clear and a number of submerged plants are present including water starwort. This plant is ideal for newts to lay eggs on. Many water beetles were observed during the survey indicating the water is good quality with high oxygen levels. A moorhen was present, preferring the overgrown end of the pond. There is currently very little to shade this pond and consequently the aquatic plants have flourished and the water is very clear. There is a horse chestnut tree adjacent to the pond which, in future years, will drop many leaves into the pond and cast a great deal of shade. This tree should be pruned accordingly to minimise these impacts. The scrub at the northern end of the pond should be maintained to provide shelter for animals but to prevent the bramble from swamping the pond. The liner seems to extend much higher than the water level reaches and this may cause problems for amphibians leaving the pond. In the summer months, young amphibians will leave the pond to start the terrestrial phase of their lives. Amphibians struggle to cross hot plastic liners as they cause them to dry out and potentially stick to it. This can be overcome by encouraging plants to grow over the liner and trail down to the water level. These plants would also help small mammals that have accidentally fallen in to the pond to escape. This pond also lies on the ditch line and is located at the rear of Laurel Farm. It is fed by an underground stream from the north and drains into a ditch to the south. The pond is surrounded by dense hawthorn, ash and bramble scrub and access is very limited. It sits in a deep depression but the water is very shallow due to a deep layer of leaf litter. Beyond the scrub, there are hedgerows and grazed fields where amphibians can forage and move in relative safety. The scrub area contains a lot of lying dead wood and plenty of hibernation sites for amphibians. There are also some dead branches that have fallen in the water and trees that have fallen over but now grow up from the waterís edge. The survey of this pond is limited due to poor access and very shallow edges of the water. Yellow flag irises grow on the pond margin with water mint and willowherb. No aquatic plants were recorded and only phantom midge larvae, mosquito larvae and blood worms were observed. This pond currently suffers from over-shading and inundation with leaves. The deep layer of rotting leaves contributes to lowering the oxygen levels of the water which was indicated by the records of invertebrates typical of poorly oxygenated water. To increase this pondís suitability for amphibians, some of the over-hanging trees should be heavily reduced or removed. This would allow more light in to encourage pond plants to grow and would reduce the leaves falling in to the pond. The current depth of leaves could be addressed by clearing out the pond with a digger. This dramatic task would help improve the water quality and the deeper water would appeal to more species as it is less likely to dry out or freeze through. 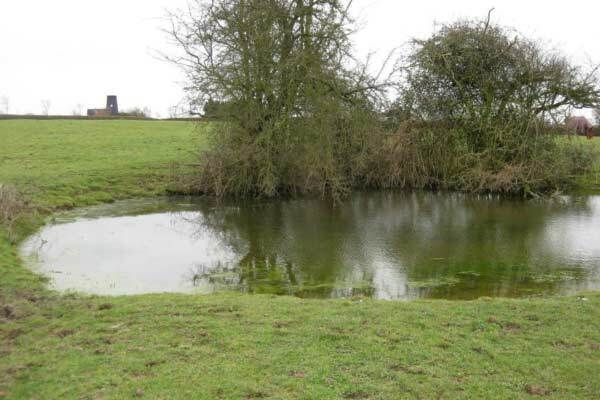 This pond is located in the corner of an old ridge and furrow field which is now grazed by horses. The pond is a traditional farm pond and serves as a water supply for the livestock. Consequently the western edge is slightly poached. The pond has gradually sloping edges except for the eastern edge which has a steep bank of approximately 1 metre high. The top of this bank has a couple of small hawthorn trees which extend in to the pond slightly and act as cover for the nesting moorhens. There are thick hawthorn hedges in close proximity to the pond. The pond supports a diversity of plants including hard rush and creeping cinquefoil around the margins and water crowfoot and water plantain in the water. There is a large amount of submerged water milfoil present which has been used by the newts during egg-laying. A number of water beetles were observed in the very clear water. A total of 12 great crested newts were seen in one survey session and some females seen egg-laying. The pond is currently suitable for great crested newts to breed in due to the availability of submerged plants, food and lack of predators. Horses cause a slight disturbance and are responsible for fluctuations in the nutrient level of the water. This is evident through occasional increases in algal growth and can be controlled by removing the algae regularly. This should not be done in June/July as great crested newt tadpoles will be in the pond and could accidentally be removed with the algae. The hawthorn trees do not cast too much shade over the pond; however the amount of shade should not be allowed to increase so the trees should be pruned accordingly. This is a private pond located in the front garden of a residence on Mill Road. It is fed by water from the ditch line and rainwater. The pond itself is well established and is surrounded by excellent terrestrial habitat for amphibians. Paving slabs and flowerbeds border the pond, providing plenty of foraging and sheltering opportunities. There is also a dense hawthorn hedge that extends the length of the garden. Dry stone walls abound the driveway and amphibians have been found using these for shelter in the winter. During the survey, a number of great crested newts were observed in the pond and it is likely they are breeding there. There were also some great diving beetles which indicate a healthy pond with plenty of food available. Yellow flag irises are growing around the edge of the pond and in places the flowerbeds almost spill in to the pond creating a gradual transition from aquatic to terrestrial habitat. There are two large ash trees adjacent to the pond. The ash trees have dropped a great number of leaves into the pond which has resulted in a deep layer of leaf litter on the bottom. The process of these leaves rotting will use some of the oxygen in the water and lessen its suitability for wildlife. It would be recommended that the leaves are removed from the pond and the trees reduced so they do not overhang the pond as much. The pond work must be done in winter and care must be taken as newts are known to hibernate at the bottom of ponds. Ideally the leaves would be deposited nearby to allow any creatures to crawl out. The pond does suffer from duckweed forming a blanket over the surface. This blocks out the light and limits growth of plants and organisms under the water. The duckweed is regularly being removed and this should continue. This large pond is situated at the northern end of the village and is owned and managed by Great Gidding Parish Council. The pond has a cobbled bottom as it was historically used as a place for carts to be cleaned and horses watered. Today the pond is managed for its wildlife and as a place for people to appreciate nature. In January 2011, this pond underwent a transformation. It had become overgrown with common reedmace and had a deep layer of leaves and silt at the bottom. The adjacent willow trees had not been pruned back for some years and consequently cast a lot of shade over the water. The reedmace and silt were removed from the pond. This has resulted in a pond with clear water and lots of open space. The new platform at the southern end will enable school children to safely discover what lives in the pond through pond dipping activities. The willow trees were removed and some of the wood used to create a log pile for hibernating amphibians. The remaining tree stumps will also provide cracks and holes for creatures to shelter in. The small stone wall in the garden behind the pond will provide similar sheltering spaces. At the time of the survey the pond was very bare but did have a few plants of water forget-me-not, each of which had newt eggs attached. At least some of these eggs were confirmed to be of great crested newts. To encourage the newts to breed, strips of plastic were anchored in the pond as artificial egg laying sites. This proved very successful with over 100 eggs being laid on the plastic alone. Adult great crested newts were observed in the pond. There were also some water beetles, water fleas and dragonfly larvae. These invertebrates indicate a good water quality with sufficient oxygen levels. As the pond settles after the restoration work, the diversity of invertebrate species will increase. It is anticipated that over the coming year, plants will naturally establish in the pond. If few plants are available for newts laying eggs then the plastic strips technique should be used again. The presence of reedmace will need to be monitored and the extent of its cover managed by cutting the stems well below the water level in the winter. The grass surrounding the pond is kept short to aid access and safety. Wherever possible the grass should be left slightly longer to act as cover for amphibians. The amphibians are most active after light rain in the early spring (February) and late summer (July/August) so grass cutting at this time should only be done after an inspection of the grass area. This small pond is situated in a field to the west of the Vicarage. The field is currently grazed by horses that use the pond for drinking. Consequently the western end of the pond is heavily poached whereas the eastern end is very overgrown with hawthorn and bramble. This latter end has steeper banks and access to the water was very limited. The pond does not appear to be managed at the moment. There is a thick hedge and large bramble patch alongside the road which provide good habitat and protection for amphibians. This dense vegetation attracts a number of birds including robins. Male and female smooth newts were observed during the night-time surveys. The water was very cloudy due to the horses stirring up the mud so there may be more amphibians present. Likewise it was difficult to survey for aquatic invertebrates, however water beetles were found. There did not appear to be any submerged plants and it is likely there is a deep layer of leaves in the bottom of the pond. There were few plants growing on the poached area ñ mainly docks and plantains. The pond is primarily a storage area for the field run-off and a water supply for the livestock. It seems to fulfil these roles and also provides some benefit to amphibians. The pond is surrounded by very good terrestrial habitat so, although it is not very suitable for amphibians to breed in, it is an important source of water for them. The suitability of the pond could be improved by cutting back the hawthorn a little to allow more light to the pond and encourage aquatic plants to establish. The hawthorn does act as a good barrier against the horses so should be retained in a reduced state. The bramble and hedge are excellent for amphibians and ideally placed next to the pond. These features should be maintained to provide cover and damp places for the amphibians to over-winter. To celebrate the Queenís Golden Jubilee in 2002, a small woodland was planted to the north-east of the village. The woodland has public access via a path from Mill Road and is an area for all to enjoy. A range of trees were planted including blackthorn, hawthorn, oak and ash, with wide grass rides between the wooded blocks. These rides are sun traps and provide invertebrates with long grass to shelter in and flowering plants to feed from. The blossom on the trees is also a good source of nectar for insects such as butterflies. This area of woodland lies between ponds 10 and 11, both of which are breeding ponds for great crested newts. The proposed new pond for the woodland would be a great benefit to the local amphibian population as it would be another wildlife-friendly pond in the landscape. The woodland is currently quite sparse but, as it grows, it will provide excellent foraging opportunities for amphibians and create darker, damper areas for them to utilise. The woodland is surrounded by a dense hedgerow which acts as a corridor for creatures moving around the area. The pond will be located in the northern half of the woodland, in a large open area. This will ensure it gets lots of light and few leaves will fall into it. The pond will be deep enough that it will not freeze through during the winter as this will enable amphibians to over-winter at the bottom of the pond in safety. The large size of the pond means it will be possible to create a variety of microhabitats according to differences in the bank gradient, the shape of the pond edge and the proportion of the water that is vegetated and not. This will attract a wider range of species including some dragonflies, beetles, amphibians and birds. Great Gidding has a high concentration of ponds within a relatively small area. The purpose and history of these ponds is varied but they all benefit the local amphibian populations in some way. Four species of amphibian were found in ponds the length of the village. The survey was focussed on confirming the presence of great crested newts and this was achieved for eight of the 12 ponds surveyed. This is not to say that great crested newts are not using the other ponds, just that they were not observed during this survey. The map overleaf shows the distribution of species recorded. Amphibians require water at all times of the year. In the spring they need a pond to breed in and for the rest of the year they must stay moist so will find dark damp places to live. Logpiles and compost heaps make excellent places for amphibians to shelter as they are damp and also attract many of the amphibians prey species such as worms, slugs and spiders. These surveys have indicated the value of dense bramble and hedgerows with good ground cover. The hedgerows create a network across the village to enable amphibians to move between ponds and scrub areas in relative safety. Whilst surveying the ponds it became clear how valuable they are for other wildlife too. Some of the larger ponds were home to moorhens and coots and they are bound to be used by foxes and other mammals seeking a drink. The Old Brick Pits pond is used by bats that fly low over the watersí surface catching mosquitoes and small flies. Bats and birds are attracted to ponds as many types of invertebrate have aquatic larvae and they can catch the adults as they emerge from the water. This survey has taken a snap shot of the amphibians in Great Gidding and now annual surveys will be undertaken to monitor their distribution and numbers. In order to better assess the size of the frog and toad populations, surveys should also be conducted in February and March as these species breed earlier in the year than newts. Combining the amphibian counts with surveys of the pond invertebrate life, will give an indication of the water quality and the availability of food for the animals. This project is funded by The National Lottery through Awards For All.